No living room is complete without a side table. The perfect place to put your drink down, rest a good book while you relax, or even store your remotes. No cosy living room is complete without a telephone table, which is ideal for a huge range of everyday uses. Available in beautiful natural oak, exotic mango wood and painted hardwood, our side tables come in a variety of styles to suit all homes and are built to last a lifetime. The natural beauty of solid oak speaks for itself and our stunning solid wood side tables showcase this perfectly. Made using only the most supreme cuts of natural oak, carefully selected for their handsome golden colour and superior grain pattern, our telephone tables promise to look great for years to come. For a contemporary finish, look for a modern design that has a boxy, geometric shape. The side table from the Alto range has ample space to place a lamp or ornament, as well as a bottom shelf which is just perfect for books, magazines, and remotes. For a more elegant, rustic look, choose a vintage-inspired occasional table that has antique-effect features such as gently flared cornices, inlaid groove detailing and soft, rounded edges. The French Farmhouse range includes a beautiful occasional table that will add character and charm to any room in your home. Tropical cuts of stunning mango wood will bring an exotic edge to your design scheme, and a mango side table is the perfect way to incorporate this look into your living room scheme. Defined by its distinctive grain pattern, golden brown hues, and chunky look, a mango telephone table is effortlessly cool and looks great on its own or as part of a set. 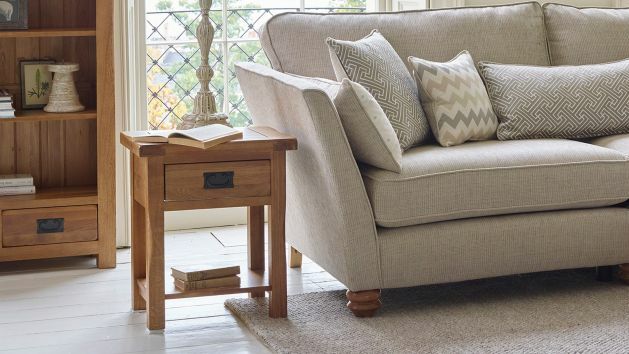 Whether you’re looking to buy an entire furniture set or a simple side table to complete your living room, every single Oak Furniture Land purchase qualifies for free home delivery. We’ll even bring the furniture to the room of your choice. Spend over £500 on our fabulous furniture and you can spread the cost over monthly payments for up to 4 years. Purchases over £3,500 can enjoy the benefit of interest free credit for up to 3 years, allowing you to pay more comfortably. Discover more about our flexible finance options.